Throughout Latin America, governments have established programs to promote literacy and an appreciation for literature. Argentina created el Plan Nacional de Lectura in 2008 and has a wonderful collection of resources available online, including an extensive selection of books in PDF. 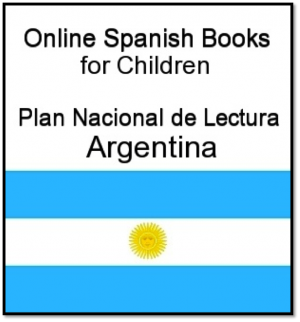 The Plan Nacional de Lectura website is worth taking time to explore; in addition to texts for every level reader you will find educational resources, author interviews and booklists. Most of you are working with Spanish language learners and young children, so I am going to mention a few of the stories you might find most useful. I wrote recently about the best strategies for reading aloud to language learners. These stories are an excellent opportunity to use those techniques with children. From the top navigation bar select Recursos, and in the drop down menu select Literarios. You can also access the submenu directly at this link Recursos Literarios. Use the search box or scroll through the titles available to locate these stories. The collection continues to grow. Right now, El libro de lectura de bicentenario: Inicial is on page 15 of the available titles. You will undoubtedly find other texts that will be useful to you! I am listing these stories more or less in order of difficulty. Cuello Duro de Elsa Bornemann – Animal friends join forces to help giraffe when he cannot move his neck. El sombrero de Juan de Ema Wolf – A wonderful variation of the concept behind the classic folktale The Mitten. Bellos Cabellos de Adela Basch – In the format of a play, a funny story about a haircut. Amor en la biblioteca de Liliana Cinetto – A story poem (rhyming verse) about a princess and a pirate who escape from their books. Cumpleaños de dinosaurio de Mónica Weiss – A dinosaur-themed birthday party gets a surprise visitor. Amigos por el viento y La mejor luna de Liliana Bodoc – Two stories. The second, La mejor luna is the easier story and an excellent choice for Spanish learners. El libro de lectura de bicentenario: Inicial – This is a collection of readings. Some like Los leones no comen banana are very simple. Others are more difficult. Trabalenguas y adivinanzas. Recopilación de Carlos Silveyra – Tongue twisters and riddles. There are two collections with the same title available.